This simple tutorial shows how to easily convert DjVu to PDF file in Ubuntu system. DjVu is a computer file format designed primarily to store scanned documents, especially those containing a combination of text, line drawings, and photographs.It uses technologies such as image layer separation of text and background/images, progressive loading, arithmetic coding, and lossy compression for bitonal (monochrome) images. This allows for high-quality, readable images to be stored in a minimum of space, so that they can be made available on the web. (from Wikipedia). 1. install DjView4 from Ubuntu Software Center. 2. Launch DjView4 from the dash and open .djvu file you want to convert. 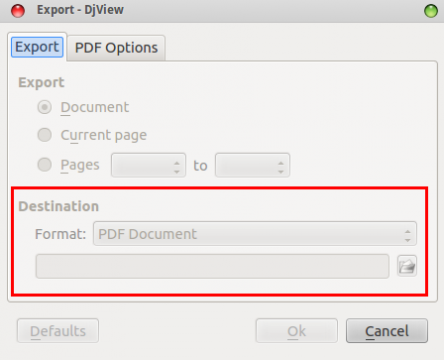 Navigate to File -> Export as…, under destination format PDF document. No user responded in " Easily Convert DjVu Document to PDF on Ubuntu "